A car’s suspension maximizes the friction between the tyres and the road surface, to ensure steering stability, good handling and the comfort of the passengers. A bump in the road causes the wheel to move up and down. The magnitude, of course, depends on the size of the bump. Either way, the car wheel experiences a vertical acceleration as it passes over an imperfection. What is required of the system is that it will absorb the energy of the undulation, allowing the frame and body of the car to ride undisturbed while the wheels follow the bumps in the road. 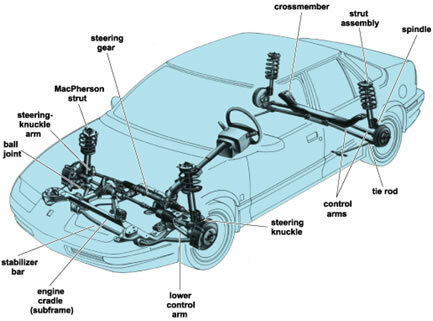 Rack-and-pinion steering is the most common type of steering on vehicles. A rack-and-pinion gear set is a very simple mechanism, as you can see in the diagram. A tie-rod connects each end of the rack to the wheel assembly. When you turn the steering wheel, this turns the wheels to the left or the right.